A. Troubleshooting your engine – Here are the steps and information to solve any problem with your paramotor. C. If you need us to repair your engine, please see these important instructions. Gear and wheel pullers should never be used when working with aluminum engine parts or housings! 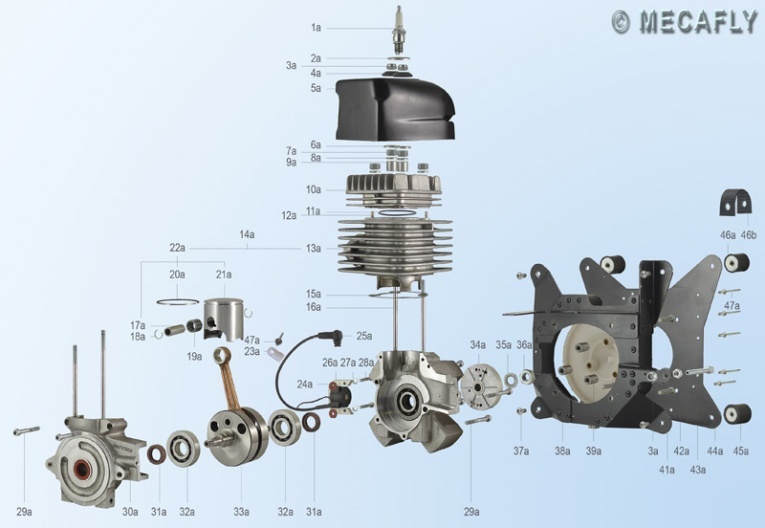 SPECIFICATIONS – Gaps, torque values, dimensions, timing value, and maintenance intervals for the Top 80. Breaking in the Top 80 – A new motor will last longer if properly broken in. Clutch – This page also includes how to properly mount the redrive so that clutch does not drag. as much as aluminum so a press MUST be used to install the clutch bearings. They will not just "clink" into place. Cooling box fins – They eventually will break off from intense engine vibration. Here is the fix. Cooling fan – it is integral to the cooling box and is removed with it. See "Cooling box" above. Cruise control – Not a good idea and here is why. Cylinder honing – Cylinders that are lightly worn can be honed and the piston ring replaced. Cylinder piston sizes – This is a table of the piston sizes (letters) for the corresponding cylinder diameter after boring or honing. Cylinder replacement, new – See "Determining the correct size of gasket to use" and follow the directions. If a compression check gives a value less than 90% of specifications, replace the cylinder including the piston and ring. Also, see "rebuilding 2-cycle engines" below for more general info. Instead of replacement, pilots may have their cylinders bored and honed at this shop (RB Designs). You will have to measure the cylinder diameter with a micrometer, determine the correct oversized piston needed, get it from Miniplane-USA, and send it all in to RB Designs. 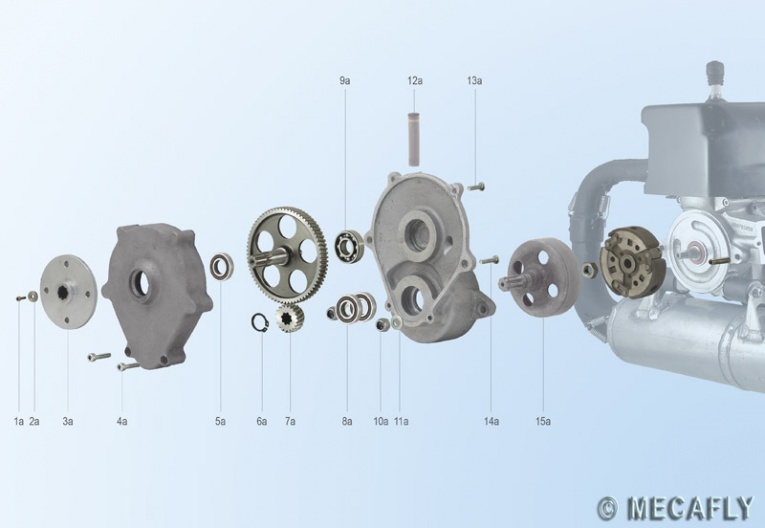 De-carbonizing a two stroke engine – It must be done often enough to prevent overheating. Detonation – This is a serious problem caused by cheap gasoline while running engines near sea level. Use AVGAS or premium ethanol-free fuel whenever possible in order to prevent this problem. Incorrect ignition timing and too little cylinder squish can also cause detonation. Engine stall – Sudden engine stall when full throttle is applied can have various causes. Study the 2nd paragraph in the throttle shaft play page. Exhaust port gasket, nuts, and springs – How to install the gasket correctly and then properly tighten the nuts and springs. Exhaust system springs – How to remove and install them correctly. Note: for a while Miniplane supplied springs which constantly broke. Exhaust port repair tool – If the cylinder exhaust port is damaged, this tool can repair it. Here is how to do it. Finger screw modification – Every time the cooling fan is removed, the finger screws should be replaced ($$$). Here is how to re-use them. Fuel system leaks – If air finds its way into the fuel system piping/filters, the engine can be damaged from fuel starvation. These leaks must be fixed! Fuel system quick test – See the "Quick fuel system test"
Fuel tank cap leaks – How to find and fix the factory defects which make it hard to prime the fuel system. Harness strap repair – Thinner pilots routinely have the buckles break. Here is how to easily fix the problem. High altitude use – How to tune your Top 80 for use at high altitudes (part of the WG-8 carburetor page). Ignition timing check – This method will give a precise timing value that other methods are unable to do. Leaks, fuel – see "Fuel tank leaks" or "Fuel system leaks" above. Main bearing seals – If they leak slightly after 100's of hours of use, it only causes a little mess and is to be expected. Leave them alone. Mounts, rubber (engine) – Here is a way to quickly check them. These are normal consumable parts that fail with use. Performance issues – Does your engine run poorly, if at all? This page can help. 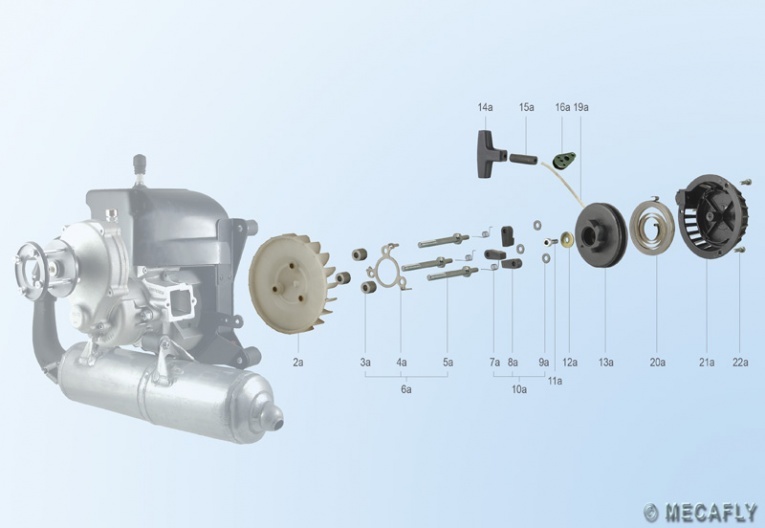 Also, see the WG-8 carburetor page. crankcase so in case you drop one, it does not disappear in the guts of the crankshaft. Be certain that the circlip is completely seated. Piston replacement – It is not advisable to attempt this without intermediate mechanical skills. See "Rebuilding 2-cycle engines" below. Piston Ring – How to remove and install it and tell if it needs replacement. 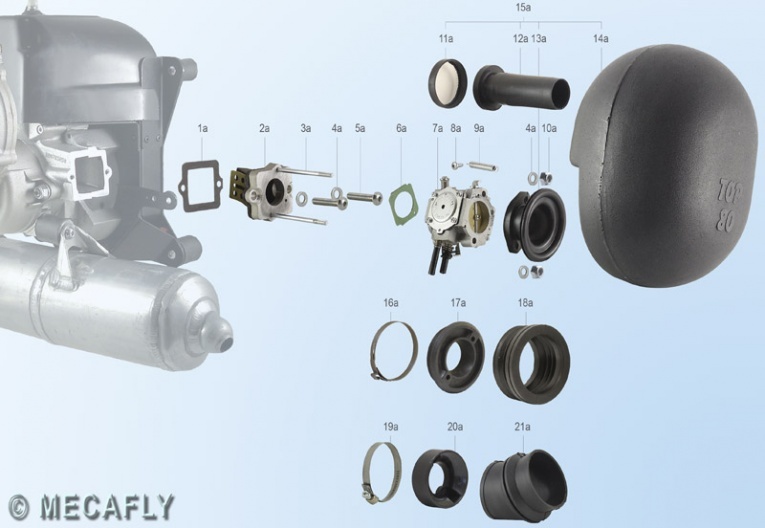 Propeller hub info, removal & installation – Note: Damaged hubs will cause severe vibration! Propeller info – General information including how to correctly attach and repair it. A propeller strike can also deform the hub – it must be checked. Propeller bolt shear problems – Read the info above (Propeller Info). Also, see "T-Nut Milling Tool" below. Propeller shaft seal replacement – Here is how to quickly and easily replace the seal without taking the redrive apart. Redrive alignment – see the clutch page. Redrive clutch – see "clutch" above. The redrive contains a clutch and a set of reduction gears. Redrive removal and installation – see the clutch page. Redrive leaks – is it a leak from the redrive, the exhaust port, or from an engine crankshaft seal? Redrive mounting and alignment – see the clutch page. Redrive mounting stud failure – Stainless steel is inferior to class 12.9 steel hardware. The former will fail on engines with many hours. Redrive lubricant – Info on the correct type, quantity, and how to change. 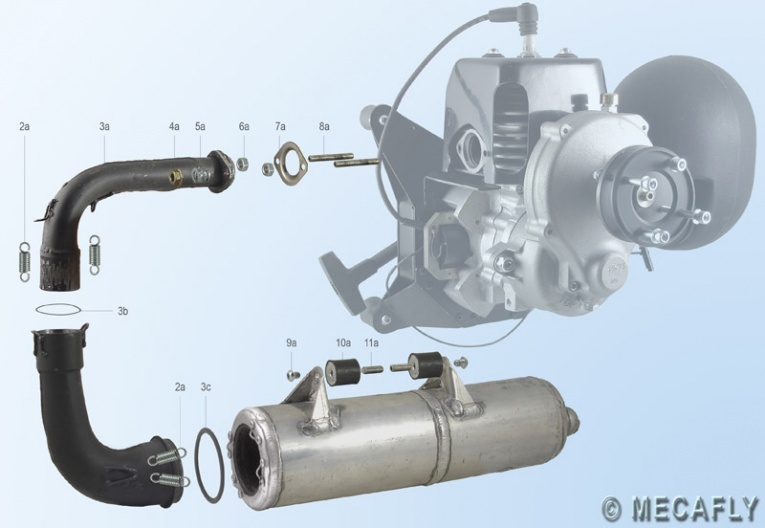 Reed valve – Note: A loose reed valve body or clogged ports will affect the fuel pump. The mounting screws must be torqued to the correct value. RTV – e.g. Permatex Blue or Ultra Grey. Used to seal case halves, some gaskets, and surfaces. Apply with clean fingers. Forget the spout that comes with the tube. It is useless. Use Ultra Grey for sealing surfaces that may become hot, like the exhaust flange gasket. MORE SEALANT IS NOT BETTER! into the engine. The fine grit can also cause the piston ring to stick, causing more damage. Always launch from grass. If it is wet, all the better. Secondary wire replacement – see "Coil secondary wire replacement" above. Starter replacement cord – This cord is 100% Dyneema line and is superior to the OEM cord. Starter – How to properly disassemble and lubricate the starter and tips on how to help it last longer. Starting your paramotor – Start your engine the first pull, every time. Here is the secret on how to correctly prime the carburetor. T-Nut milling tool – Installing T-Nuts will beef-up the propeller-hub mounting system. It is Miniplane's response to the rumor-mills on the PPG blogs. Throttle cable – Cleaning, lubrication, important modifications, and cruise control info. For kill switch issues, see "kill switch problems" above. Throttle return spring replacement – Improve throttle response, lessen hand fatigue with this modification/replacement. Vibration – Vibration is most often caused by an unbalanced propeller (especially wooden ones), misaligned redrive, or a damaged hub. Parts – Miniplane-USA has excellent stock of everything and the best service. 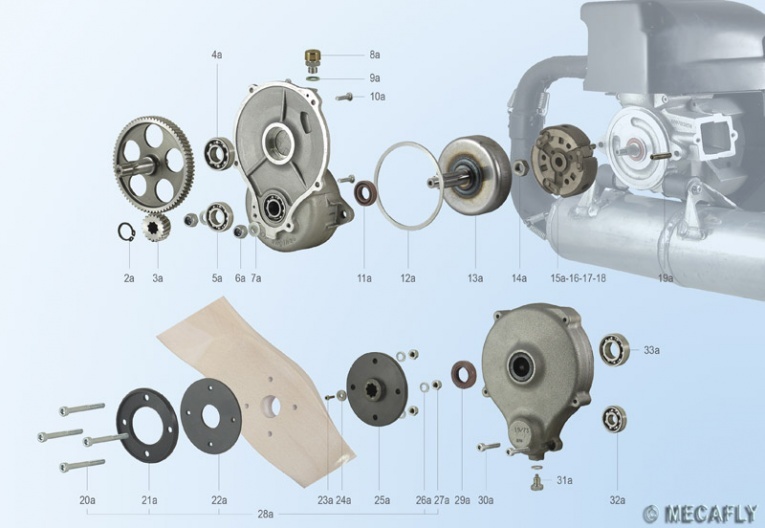 This site (in French) has detailed diagrams and information on every part in the Top 80 engine so that you can order the parts you need accurately. It is also handy when repairing the Top 80. "Where does this part go?" WARNING: Some of the part diagrams have errors in parts placement so caution is advised. Disassembly of the Top 80 – Part 1 Part 2 Somewhat detailed video on how to take apart the Top 80 properly. It does not include disassembly of the motor itself (cylinder, head, reed valves, clutch, redrive). If the motor needs additional disassembly, see the respective notes on this page. Official website for operation & maintenance – it is now in English and kept mostly current by Miniplane. Note: the English version of this site may not be online at times. Go here for Miniplane's professional service information. 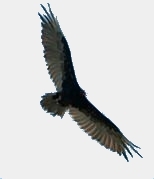 These sites are quirky, have poor English, and are often out of date. Service Notes – These include redrive overhaul (including lubricant replacement) & pull start cord replacement. IMPORTANT: The service note on the redrive is for the older models (that use grease) but the method for overhauling them is the same. When reassembling the cases, use grey type RTV sealant. If you do not feel comfortable splitting open the redrive, send it to us and we can do it for you. Mark's technique for removing the propeller hub will damage it. Remove the hub with heat, as shown on this page. Also, bearings will simply drop out of case halves if proper heat is used. Pullers should never be used when working with aluminum. When removing the main gear, do not let anything metal come in contact with the case half. Thin pieces of wood can be used to protect things. The small pinion should easy slide off the shaft and does not need to be pulled. Removing the bearings FIRST is easy.